Listen, we love Thanksgiving as much as any other American — complete with stuffing, green bean casserole and pumpkin pie. We’re not going to tell you to avoid all of the foods you and your family loves just so you’ll fit into your skinny jeans for black Friday shopping. 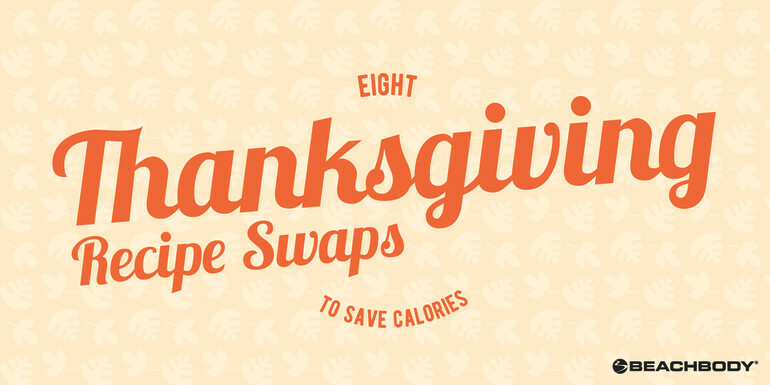 But, we’re also not going to tell you to gorge yourself into a tryptophan- and carb-induced food coma. There is a compromise, and it begins where every proper Thanksgiving does: with planning and preparation of delicious foods. You can still eat delicious and healthy foods on the day our nation feasts if you keep an eye on portion control and make some of these lower calorie Beachbody recipes. Check out how many calories (and sometimes grams of fat and sugar, too) you can save when you sub one of our comfort food recipe makeovers with traditional — or prefab — versions. 21 Day Fix-creator Autumn Calabrese and her brother, chef Bobby Calabrese have put together an incredible menu of Fix-approved Thanksgiving recipes for their new cooking show FIXATE that are healthy versions of your favorites. From Green Bean Casserole and Cranberry Sauce to stuffing and Pumpkin Whoopie Pies, they’ve got you covered. Check out FIXATE here!